As Cloud is quite a difficult technology to understand, it requires ample time to have a grasp of it completely. However, despite being complex in many senses, Cloud technology has given several organizations a transformational model for handling and managing challenging areas like SaaS, IaaS and PaaS. In other words Cloud computing and its related managed services has offered users and clients across the globe a much broader spectrum of viewing Internet as the mode of running IT operations with ease as compare to the traditional IT methods. Being prepared for disasters and restoring them immediately. Now, when we go through each one of them we come across other aspects also that make the concept of Cloud more viable. Additional factors that need to be looked upon or explored further comprise of things like setting up an efficient cloud alert system tool that helps prevent cloud from accidental disasters or make cloud events run with agility and smoothly. In computer world alert systems are software tools that are used for sending alert notifications or warnings about any kind of technical troubleshooting in the cloud storage that might prove dangerous to ongoing business operations. An alert system is incorporated or installed in the cloud storage so that users are updated about how well their cloud is functioning and running. These mediums can be in the form of email, sms, chat and calls. Role of alert systems is vital because it enables users to keep a track of the latest events and deliver it to them for their personal knowledge or just being aware of their daily tasks. Your cloud alert system should be robust enough to send notifications at the time your server is down. They help you when your routers and firewall settings are facing downtime. An alert system installed in cloud storage is useful when your Internet Service Provider or ISP is not getting connected. Thus, these are some of the points that make an alert system an important tool that can make cloud operations run even more smoothly and efficiently. Moreover, if the aforementioned points are not explanatory enough, let us explain the importance of Cloud alert system with the help of an example. Example: Suppose you have set your own cloud storage and it’s running in an exceptionally good condition. All your hardware and software worries have been solved as entire IT operations are now run in the virtual environment. With everything functioning efficiently and smoothly, a day comes when out of the blue your firewall settings and routers start running slow and at one point of time they simple don’t connect. Now, because there was no alert system installed in the cloud storage, there was no notification about firewall or router facing downtime, due to which the ongoing production and operations suffered losses. A screenshot beneath would explain you how cloud alert notification occurs in between firewall and router/ISP. Reliable Companies for setting up an Excellent Alert System? Two names that you can rely upon in fetching you an exceptionally well to do cloud alert system are RightScale & CloudWays. The managed cloud service providers offer cloud services in various domains and creating and incorporating efficient alert systems is just one amongst those services. However, availing RighScale & CloudWays cloud alert system tools will only let your businesses flourish till the extent where sky is the limit. Things to Consider while Setting Cloud Alert Systems!! 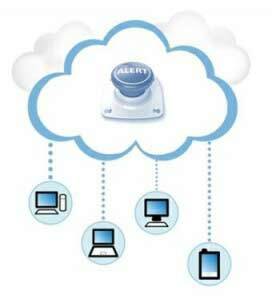 An efficient Cloud alert system is that, which takes care of all the possible trouble shooting areas. Thus, researching on all possible outcomes of creating, designing and installing a capable alert system will not only ensure security to the cloud but would intimate you prior to any to-do events on a timely basis. Example: Drumstick Events is an event management firm running all its business operations through cloud technology. A proper in-build disaster recovery and data backup plan, efficient framework for monitoring and managing cloud is all that a cloud of this company has for running business operations efficiently. Now, to run daily operations with more agility, what the company did is incorporated an alert system to its cloud storage. The reason for installing this alert system was to keep a track of whether disaster recovery plan and other cloud monitoring tools are functioning smoothly. Every time the company faces downtime issues with server of ISPs, the alert system incorporated in it sent notifications prior to such troubleshooting and helped cloud managers to deal with them effectively. Thus, alert systems are a way to prevent major technical issues that can bring huge monetary losses to businesses. In order to take a complete advantage of managed cloud services and run your businesses smoothly, incorporating cloud alert systems has become need of the hour big time.